Yesterday, thousands of UC clerical, administrative and skilled trades workers stood together to strike at every UC campus, medical center, and the Lawrence Berkeley Lab. Our strike, pickets and rallies were extremely effective at bringing our message to the public and showing the University our power and our worth. We struck over the University’s numerous unfair labor practices and in sympathy with striking UCLA skilled trades Teamsters. Our strike was lawful and protected, and the University may not retaliate against anyone for participating. If your supervisor asks you about your absence, or asks for a doctor’s note, simply reply that you were on strike. Please report any retaliation to your Union representative immediately so the Union may take immediate and appropriate legal action. Protests and pickets by over 700 strikers and their supporters at UCLA’s main campus resulted in the closure of the intersection of Wilshire and Westwood and disrupted campus medical centers and administrative offices. Hundreds of picketers also surrounded the UCLA Santa Monica Hospital and UCLA buildings at LAX and the Wilshire Center. In San Diego, hundreds of protestors and picketers surrounded both major medical centers. In the north, our members braved torrential rain and wind to show our strength and determination. 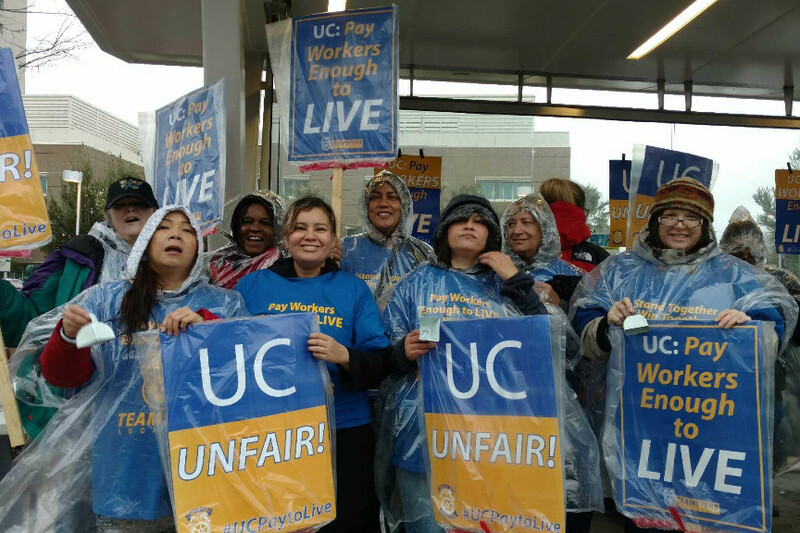 At UCSF, over 300 striking workers filled Parnassus Medical Plaza, picketing numerous entrances and loading docks. We turning back dozens of deliveries and prompted Union construction workers to walk off the job in solidarity. We came together for a huge noon rally and march, joined by several San Francisco elected officials and union leaders. At UC Santa Cruz, roads were closed, including the main entrance to the campus, as students and faculty joined the striking workers in protest. At UC Berkeley and LBL, protests resulted in traffic slowdowns and the turning away of deliveries. Our members at Office of the President in Oakland took our message directly to President Napolitano, picketing in front of her office building. 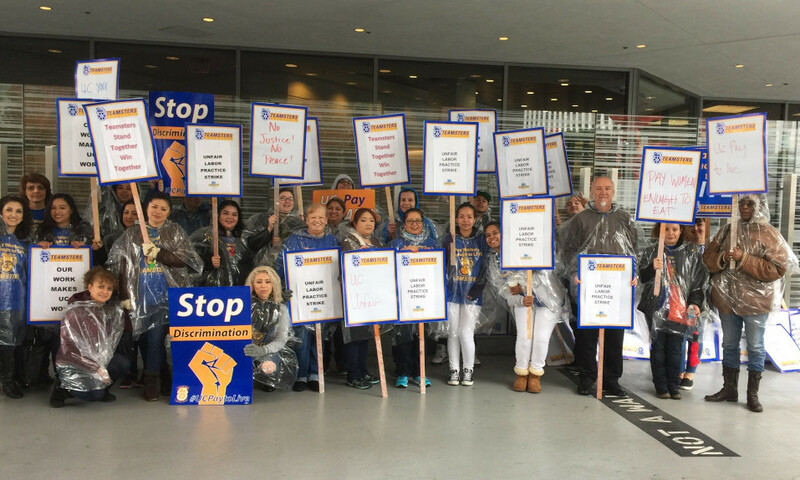 Pickets at all other campuses including Irvine, Davis, Santa Barbara and Riverside continued throughout the day. Classes were cancelled and delays occurred in areas such as patient billing and collections, childcare services, student housing, sporting and conference venues, instruction, research and administrative offices. Our CX bargaining unit is 81% female and 63% people of color. Wages are so low that over 70% suffer from hunger or food insecurity according to an October 2016 Occidental College report. We have seen our real wages decline by 24% over the past two decades, yet the University refuses to bargain in good faith for fair raises. 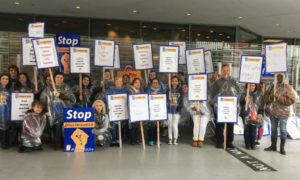 Yesterday UCLA skilled trades Teamsters concluded an immensely effective five-day strike over the University’s unfair labor practices. Skilled trades workers at both UCLA and UC San Diego, who are represented by Teamsters Local 2010, are paid below prevailing wage by as much as $10 an hour and have not had a raise in as much as four years. Thanks to all the UC Teamsters who supported the strike for your hard work and dedication. Together, we will win fair treatment and a contract we deserve!